Any quantity only $1.39 per oz over spot! There are few symbols that bear greater significance to the United States of America than the stars of the Stars & Stripes, and the American bald eagle. These symbols of freedom are recognized around the globe, and form the centerpiece of the Patriot Metals brand. 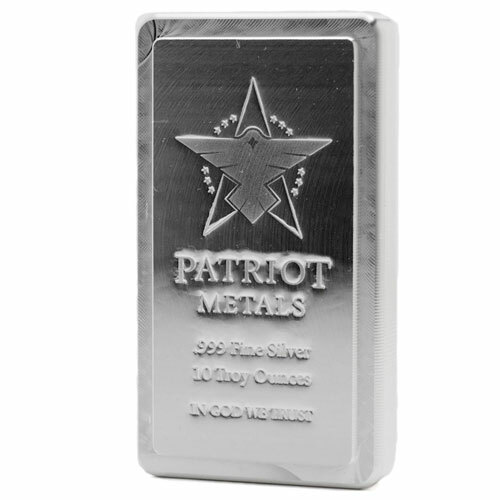 Today, the 10 oz Silver Patriot Metals Stacker Bar is available to you on Silver.com. Ships in plastic to protect the bar’s condition. Obverse features the Patriot Metals emblem. Reverse bears a swirl pattern with the Scottsdale Mint logo. New stacker design for the Patriot Metals lineup. Produced privately by Scottsdale Mint in the United States. The new stacker bar design for Patriot Metals silver bars makes it easier than ever before to easily and securely stack your silver bullion bars. Each bar has contrasting raised and inset fields on the obverse and reverse sides of the bar. The raised obverse of the 10 oz Silver Patriot Metals Stacker Bar fits perfectly into the inset reverse of another 10 oz silver bar, making it easy to stack the bars on top of one another. Patriot Metals is a brand developed within the Scottsdale Mint facility. Patriot was previously owned by Academy Corporation, which was purchased by Materion in 2011. Materion promptly spunoff production of silver bullion bars to Scottsdale Mint, with the Patriot Metals brand following suit in 2012. 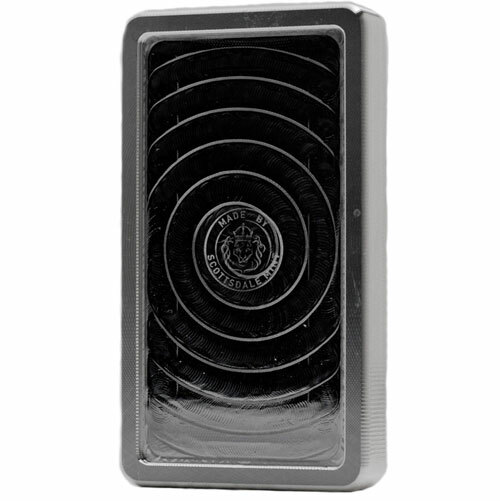 The reverse face of every bar features the seal of the Scottsdale Mint, a lion wearing a crown, in the center of a swirl pattern. These bars have a solid, rectangular shape with sharp edges that aids in the sturdy stacking of the bars when combined with others. Scottsdale Mint is a privately-operated minting facility located in the state of Arizona. The mint produces silver and gold products, and prides itself on a sustainable approach to precious metal production that sees most of its silver recycled from the photography and manufacturing industries. Please direct your questions to Silver.com at 888-989-7223, or connect with us online using our live chat and email options.